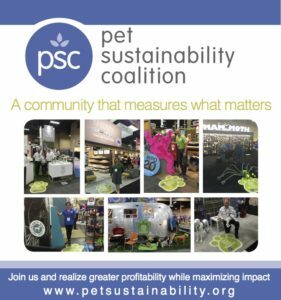 With the support of the World Pet Association, American Pet Products Association, and member hosts Worldwise and Cardinal Pet, the Pet Sustainability Coalition is making big impact at SuperZoo and Global Pet Expo. PSC’s Green Paw Program that recently received the “Ripple Award” expanded by almost 400% in 2016. The Green Paw Tradeshow Program rewards companies for measuring what matters, encourages discussion around environmental and social impact between retailers and brands, and also builds a values-led business community. A packed booth was fully engaged to hear Yalmaz Siddiqui, MGM’s Vice President of Corporate Sustainability share pieces of MGM’s sustainability program. Yalmaz graciously shared the vision of MGM and discussed topics ranging from diversity and inclusion, environmental sustainability, and community engagement. When the Coalition launched in 2013, events attracted a couple dozen executive leaders. Now with prominent speakers and growing awareness, these events are flooding the tradeshow isles. Expanded partnership between the trade associations and the Coalition could drive collaborative advancement for the industry that ensures a bright future for Fido and family. With over 75% of the industry reporting that sustainability is a growing force in the industry PSC’s delivery of business sustainability services is positioning the industry to drive increased profitability while using their business as a force for good.